Soft, moisturized lips with glossy shine. Get glossy shine, soft and supple lips with our petroleum-free Himalaya Herbals Strawberry Shine Lip Balm, formulated with vegetable oils, which are free from preservatives. Enriched with Strawberry Seed Oil, a rich antioxidant, our lip balm conditions and moisturizes lips. Apricot Kernel Oil soothes chapped lips. Strawberry Shine Lip Balm provides long-lasting moisture and protection, leaving a delicate hue of Strawberry. 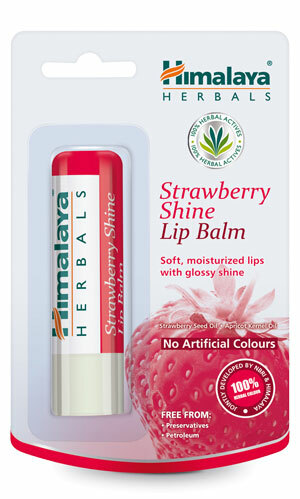 Apply Himalaya Herbals Strawberry Shine Lip Balm liberally on lips when needed.